Recently, we published the first validated index to assess histological disease activity in UC.1 We believe that some clarifications have to be made regarding the assessment of this index in both clinical practice and clinical trials. Three histological criteria have to be assessed. 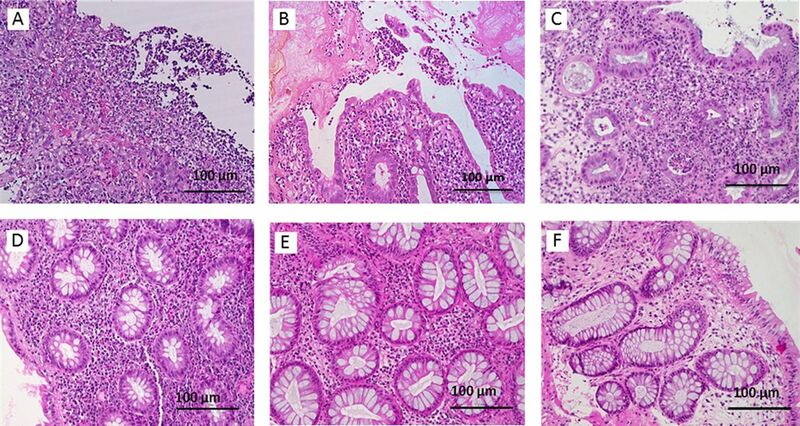 The first criterion is the presence of mucosal ulceration defined by the loss of colonic crypts replaced with ‘immature’ granulation tissue (defined as disorganised blood vessels with extravasated neutrophils) or the presence of fibrinopurulent exudate. The presence of only epithelial stripping should not be considered as ulceration. ‘Ulceration’ (grade 4 of the Nancy index corresponding to severely active disease) is simply defined by the presence or absence of this criterion on biopsy specimen (figure 1A, B). (A) Ulceration of colonic mucosa with inflamed granulation tissue corresponding to grade 4 of the Nancy index (HES ×200). (B) Ulceration of colonic mucosa with neutrophils in fibrin corresponding to grade 4 of the Nancy index (HES ×200). (C) Presence of multiple clusters of neutrophils in lamina propria and/or in epithelium that are easily apparent. Acute inflammatory cells infiltrate is moderate to severe, corresponding to grade 3 of the Nancy index. (HES ×200). (D) Presence of few or rare neutrophils in lamina propria or in the epithelium that are difficult to see. Acute inflammatory cells infiltrate is mild, corresponding to grade 2 of the Nancy index (HES ×200). (E) Biopsy specimen showing no acute inflammatory cells infiltrate and presence of a moderate-to-severe increase in chronic inflammatory cells number corresponding to grade 1 of the Nancy index (HES ×200). (F) Biopsy specimen showing a mild increase in chronic inflammatory cell number. In this case, it defines a grade 0 of the Nancy index (HES ×200). HES, hematoxylin-eosin-saffron. Moderate to severe: presence of multiple clusters of neutrophils in lamina propria and/or in epithelium that are easily apparent. In this case, it defines grade 3 of the Nancy index (figure 1C). Mild: few or rare neutrophils in lamina propria or in the epithelium that are difficult to see. In this case, it defines grade 2 of the Nancy index (figure 1D). Absence: no neutrophils on biopsy specimen. Moderate to severe: presence of an increase in chronic inflammatory cells number that are easily apparent. In this case, it defines a grade 1 of the Nancy index (figure 1E). No or mild: no or mild increase in chronic inflammatory cells number. In this case, it defines a grade 0 of the Nancy index (figure 1F). Contributors All authors contributed to editing of the article. AM-B and AS drafted the figure. Competing interests LP-B, consulting fees from Merck, Abbvie, Janssen, Genentech, Mitsubishi, Ferring, Norgine, Tillots, Vifor, Therakos, Pharmacosmos, Pilège, BMS, UCB-pharma, Hospira, Celltrion, Takeda, Biogaran, Boerhinger-Ingelheim, Lilly, Pfizer, HAC-Pharma, Index Pharmaceuticals, Amgen, Sandoz. Lecture fees from Merck, Abbvie, Takeda, Janssen, Takeda, Ferring, Norgine, Tillots, Vifor, Therakos, Mitsubishi, HAC-pharma. JS and AM-B, none. AS is a Genentech employee.